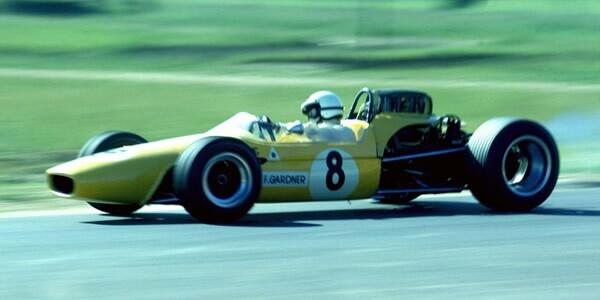 The main cars built specifically for the 2.5-litre Tasman came from Jack Brabham's factory or from the semi-works team of Tommy Atkins and Bruce McLaren plus one-off cars based on F1 designs from Ferrari and Lotus. The only Tasman cars built for customers were the Brabhams. The other leading Tasman cars were predominately converted F1 cars or F2-based specials such as the title-winning BRM P261, Brabham BT23A, Lotus 33, Ferrari 246T/69 and Lotus 49T. The only marques to place in the first six at any 2.5-litre race were Brabham (109 times), Lotus (67), Cooper (37), BRM (29), Ferrari (18), a couple of F2 McLaren M4As (14), the two Mildrens (5), an ex-F1 Lola Mk4 (2) and the McRae twin-cam (1). The Brabham BT11A gained the most top 6 finishes of any model with 29 but the BRM P261 was the highest points scorer with 153. Brabham made up nearly half the grids over the six seasons with 329 starters out of 724 in total. Lotus had 145, Cooper 94, BRM 44 and local manufacturer Elfin 26. Surprisingly, the model of car that provided the most starts was the ex-FJ Brabham BT6, popular in the antipodes with 1.5-litre Ford twin-cam engines. One of these BT6s, FJ-9-63, started 22 races driven by Frank Gardner, Roly Levis and Bill Stone, twice achieving fourth place finishes. As well as Elfin, the other locals were Mildren on 8 starts (7 with the Alan Mann-built 'Mono'), McRae on 4, Bowin and HCM each on 3, Valour, Rorstan and Rennmax each on 2, and Begg, MRC and Cheetah with one start each. One of the Mildrens, the MRC and arguably the Rorstan were effectively Rennmax cars. The HCM was a modified Lotus. The most common engine was the 2.5-litre Climax FPF with 265 starts and 16 wins. Other winners were the 1.9-litre and 2.1-litre versions of the BRM P60 V8 engine with seven wins from 35 starts, the Ford-Cosworth DFW with seven from 33, the 2.4-litre Ferrari Dino V6 with six from 22, and the 2-litre Climax V8 with five from eight. The other three wins fell one each to BRM's 2.5-litre P121 V12 (12 starts), the Repco 640 V8 (33 starts) and the F2 Cosworth FVA (50 starts). The only 2.5-litre engines to miss out on a victory were the Alfa Romeo Tipo 33 V8s starting 18 times in Alec Mildren's cars and the old 1950s P25 BRM engine that raced just once. In the smaller cars, Ford 1.5-litre twin-cam and pushrod engines accounted for 216 of the 221 starts in that class. Also, see the F5000 section for details of the 1970-1975 F5000 Tasman races.